Our country branches expect to experience steady growth in the middle market next year (homes valued at £500,000 to £1 million). Some branches in the West Country are predicting prices to increase around 4% across 2018, but the overall sentiment in the South East is much different, with prices already at a peak and predicted to remain stable in 2018. Those seeking a swift and smooth sale in the South East will need to set pricing at realistic levels; buyers in the current market are too savvy to pay over the odds. The Clock Tower is a magnificent 5 bedroom Grade II listed home, available through our Burnham Market branch for a guide price of £1,600,000. Smaller, family-friendly homes will continue to experience an increase in demand as competition between families and downsizers continues. 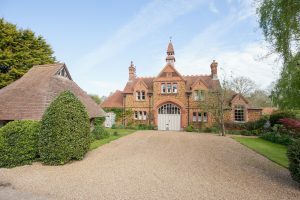 Overall, there is strong demand from families moving out of London in 2018, reflecting the trend of a desire for a more peaceful, tranquil lifestyle in the countryside. City workers are more willing to commute longer distances three to four days a week, especially if they can get a seat on the train and work on the journey, as well as work from home once or twice a week. This is expanding the commuter belt further, beyond the traditional Home Counties, even to the villages between Cirencester, Cheltenham and Stroud. The Cotswolds remains a hotspot for families with parents wanting to increase the amount of time they can work from home, and give their children the best possible environment to grow up in. As for the traditional commuter locations, villages in East Anglia and the South East will remain favourites among families. However, with a limited supply of homes, competition between families and downsizers, who have the same dream home in mind, will be intense. The new homes market in the country continues to be driven by buyers looking for high quality and well-sized new homes, valued between £250,000 and £750,000. Homes that require very little maintenance are particularly sought-after by downsizers in the South West. However, there is currently a scarce supply, due to planning policy, which favours new homes in urban extensions or new towns as opposed to the country.